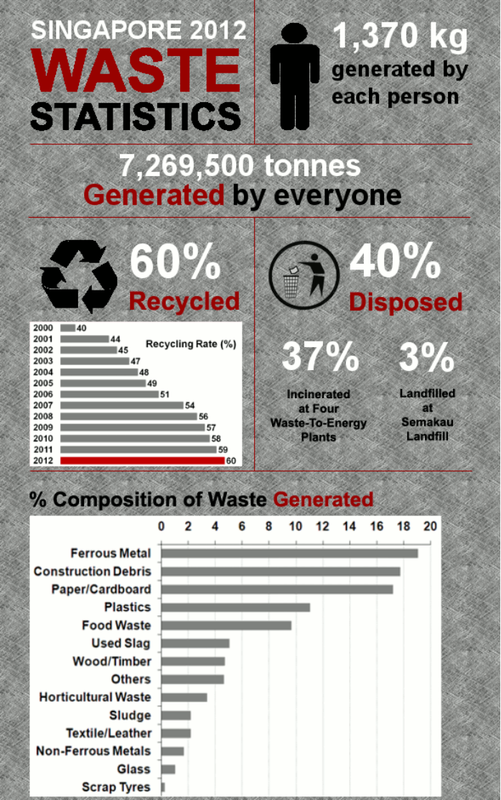 Singapore's growing population and booming economy have contributed to a 6-fold increase in the amount of solid waste disposed from 1,260 tonnes a day in 1970 to a peak of 8,338 tonnes a day in 2014. 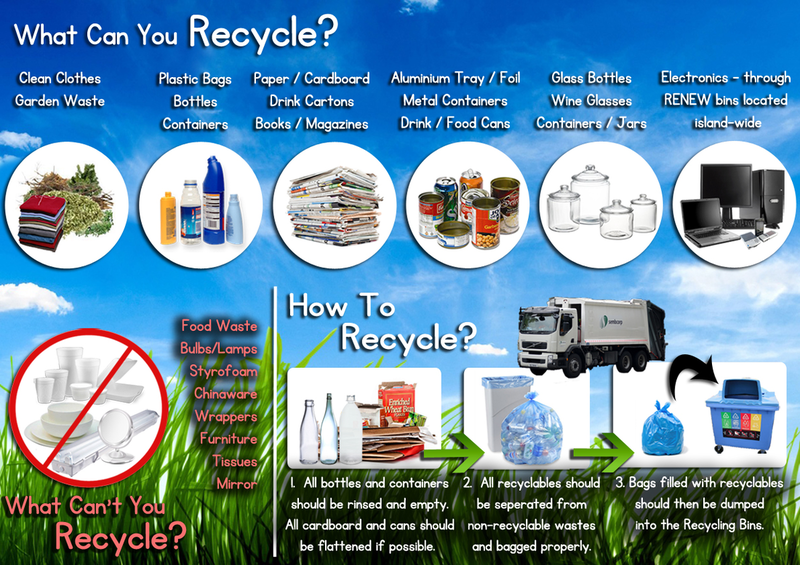 Solid waste management in Singapore begins at homes and businesses. Prior to the collection of solid waste, recyclables are sorted and retrieved for processing to prolong the lifespans of recyclable materials. 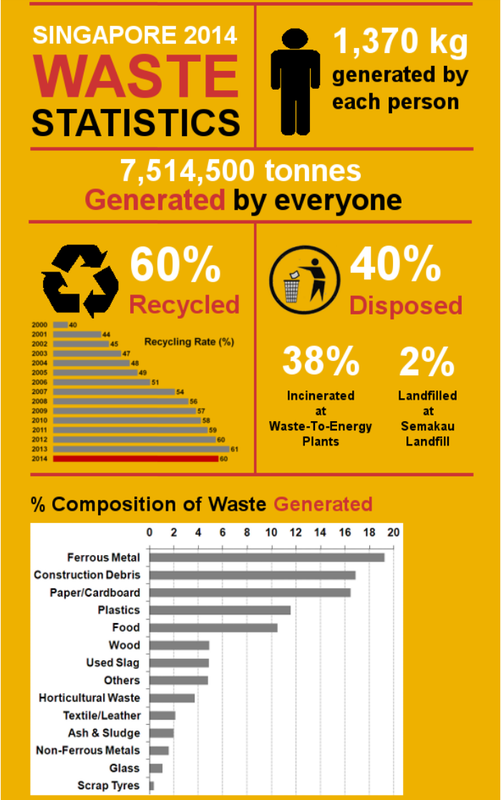 The solid waste that remains is then collected and sent to the various waste-to-energy plants for incineration. Incineration reduces the volume of solid waste by about 90% and produces steam that runs turbine-generators to generate electricity. The incinerated ash and other non-incinerable wastes are then transported to the Tuas Marine Transfer Station (TMTS) for the barging operation to Semakau Landfill where they are disposed of. 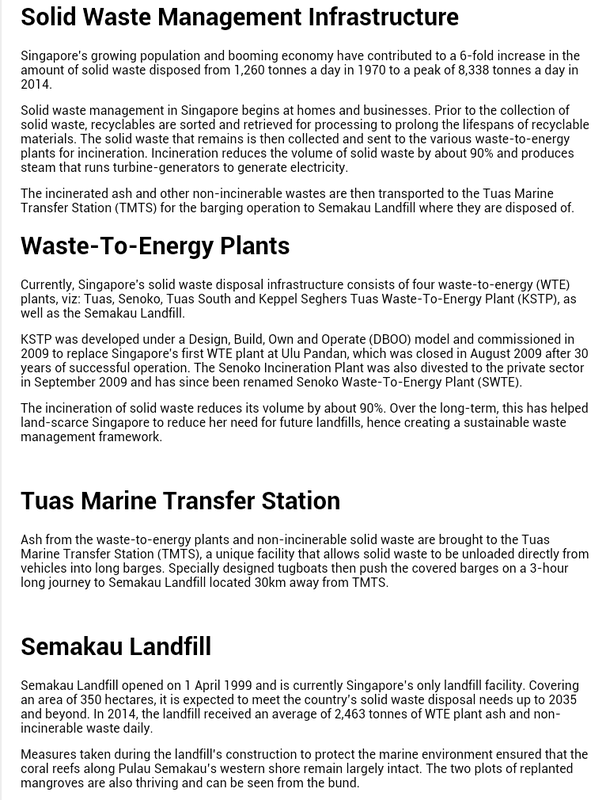 Currently, Singapore's solid waste disposal infrastructure consists of four waste-to-energy (WTE) plants, viz: Tuas, Senoko, Tuas South and Keppel Seghers Tuas Waste-To-Energy Plant (KSTP), as well as the Semakau Landfill. KSTP was developed under a Design, Build, Own and Operate (DBOO) model and commissioned in 2009 to replace Singapore's first WTE plant at Ulu Pandan, which was closed in August 2009 after 30 years of successful operation. 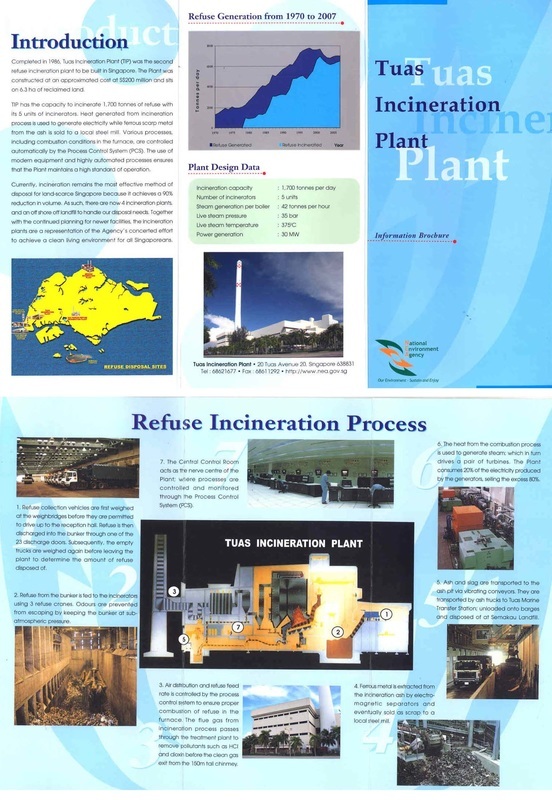 The Senoko Incineration Plant was also divested to the private sector in September 2009 and has since been renamed Senoko Waste-To-Energy Plant (SWTE). 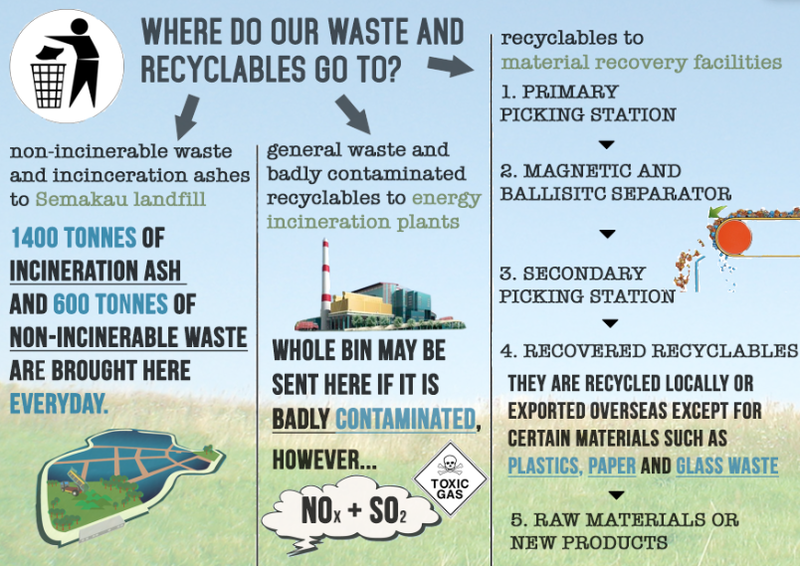 The incineration of solid waste reduces its volume by about 90%. Over the long-term, this has helped land-scarce Singapore to reduce her need for future landfills, hence creating a sustainable waste management framework. HDB is currently exploring a new initiative with the Ministry of the Environment and Water Resources (MEWR) and the National Environment Agency (NEA), known as "Save As You Reduce". 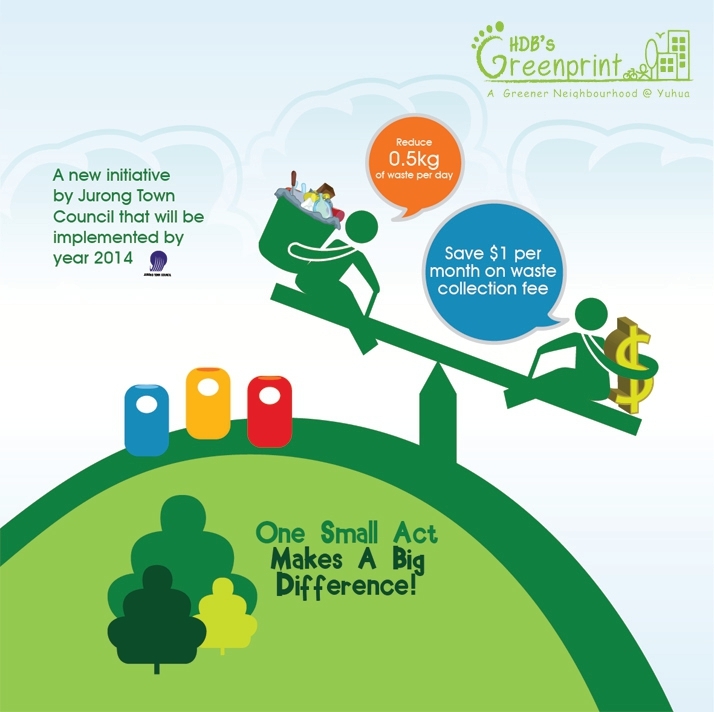 This provides incentives for Jurong Town Council to encourage higher recycling rates and reduce waste collection fees.